The objective of this activity is to raise safety awareness among local people (including students), and encourage them to comply with general traffic rules and signs, thus becoming an active part in preventing and reducing road accidents and casualties. This activity aims to provide general safety knowledge and necessary safety information - e.g. how to use electricity safety, etc. – in order to avoid unexpected accidents or incidents to local villagers and students. 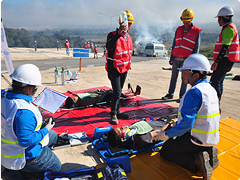 This activity aims to prepare participants for accidents and emergency situations related to operational risks and their consequences. 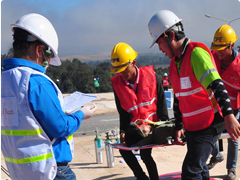 This preparation includes a drill plan that addresses resources, responsibilities, communication and operation procedures, as well as other aspects required to effectively respond to emergencies associated with project hazards. To save and protect lives of all involved parties, HPC has consistently organized in-house training for HPC occupational health and rescue officers, contractors, and medical staff from local hospitals. In addition, the Company has continually sent delegates to participate in various related training, organized by professional occupational health teams from both governmental and non-governmental organizations. In an attempt to foster a better health among local people, HPC has strived to educate them on health care issues and provided them with necessary information on health. The World Environment Day is celebrated every year on the 5th of June. In 2012, EMU-Hongsa District and HPC staff joined the celebration by undertaking tree-planting and clean-up campaigns, inviting participants to plant trees and collect waste around Hongsa Town, in order to maintain a green and clean environment. Aiming to create awareness on natural resources conservation, on every June 1st, HPC joins Hongsa District in the celebration of the ‘National Planting Day’, and arranges activities with student leaders – such as waste management, and road traffic safety. The ‘National Aquatic and Wildlife Conservation Day’ is celebrated every year on the 13th of July. Organized by HPC in collaboration with Hongsa District at Nam Ken, Ban Thaenkham, the event was attended by delegates from relevant GoL authorities and HPC staff. At the event, more than 20,000 fingerlings were released into the natural water resource in order to increase the fish population.